Coatings' unique, heavy duty, epoxy coating, Devran 234QC. It applies and cures at well below freezing! 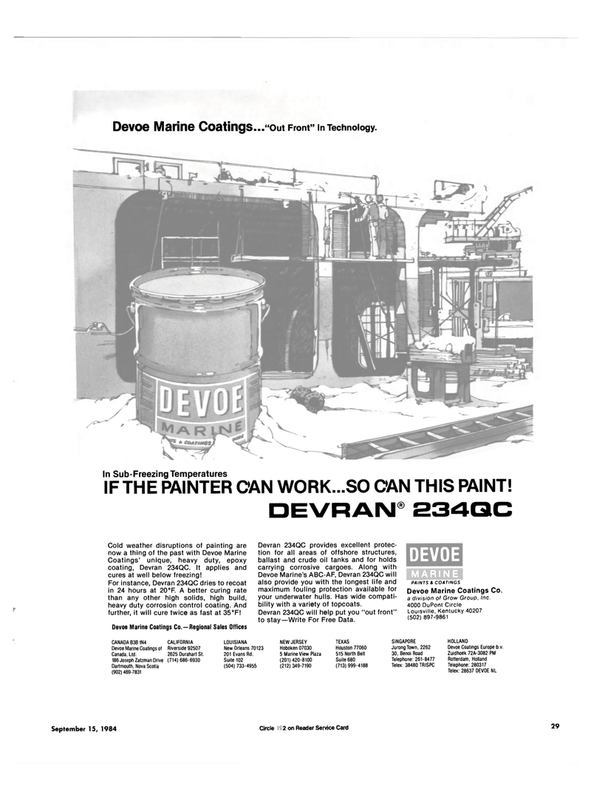 For instance, Devran 234QC dries to recoat in 24 hours at 20°F. A better curing rate than any other high solids, high build, heavy duty corrosion control coating. And further, it will cure twice as fast at 35°F! Devoe Marine's ABC-AF, Devran 234QC will also provide you with the longest life and maximum fouling protection available for your underwater hulls. Has wide compati- bility with a variety of topcoats. Devran 234QC will help put you "out front" to stay—Write For Free Data. Devoe Marine Coatings.. ."Out Front" In Technology. IF THE PAINTER CAN WORK...SO CAN THIS PAINT! crude oil tanks Marine View Plaza Canada Ltd.